Corzo's bottle was designed by Fabien Baron who was tasked with modeling the style of Luis Barragån Morfîn whose architecture impacted 20th century modernism in a big way; specifically noted on the bottle with the "Waterfall" mouth. The piñas are roasted for at least 5 hours before extracting the nectars and fermentation is begun with house yeast as classical music is played! It is then triple-distilled and artificially oxygenated before bottling. "DOUBLE GOLD 2006 SAN FRANCISCO SPIRITS COMPETITION. Aged for more than one year in small white oak barrels for an authentic, smooth flavor Corzo Anejo is the finest super-premium tequila." "An exceptionally elegant and flavorful tequila with notes of citrus and vanilla, Corzo silver is best enjoyed as a sipping tequila or when prepared with the highest quality of mixers." 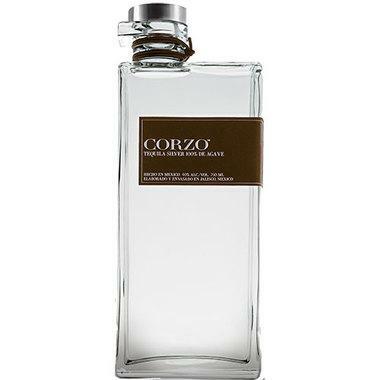 "Corzo Reposado is the perfect blend of the purest and most refined Agave available. A Tequila with of extraordinary character with full aroma and flavor of blue agave."